This service will charge you a 3% “convenience charge” on the amount being paid. The convenience charge is collected by Official Payments and is NOT collected by the City of Jefferson. 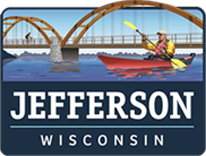 The City of Jefferson WILL NOT receive any portion of the 3% convenience fee. SELECT “Wisconsin” from the first drop down menu. SELECT “City of Jefferson” from the second drop down menu and then in the third drop down menu SELECT “Taxes”. Type in the amount you wish to pay (a $1,000 payment is used as an example-below) and SELECT “Continue”. This may be any amount, but please know that the first installment (of real estate taxes) must be paid in full by January 31, 2016 to avoid your tax bill becoming delinquent. After the 31st of January, DO NOT USE THIS WEBSITE. If you agree with the Terms and Conditions and the Convenience fee, SELECT “Accept”. When this screen pops up you will need to do a good deal of entry. Anything with a RED asterisk will need to be filled in to ensure proper application of your payment. You will also need to know your tax “Bill Number”. The bill number can be found in the upper right hand of your bill or on any of the three stubs on the lower portion of your bill. Confirm Details – All of the information you have just entered will be represented for a final confirmation before the payment is submitted. When you SELECT “Submit” Official Payments will authorize the payment with your card-issuer in real time. This process will only take a few seconds. Digital Receipt – Official Payments will issue a unique confirmation number for your payment as part of a digital receipt, which can be kept for record keeping purposes. A printer-friendly version is available and only the final digits of your card or account information is re-displayed. City Staff will be notified of your payment the following day. The City Office will then post your payment to your bill. Receipts for these payments will be sent as time allows. If you wish to follow up with a phone call to our office, please allow staff until noon to process your payment(s). At year end and on January 31st, there may be some delay in posting receipts due to the volume received. If your payment is posted on the Official Payments Website by the 31st of December or January, your payment will be considered timely.